Looking to buy the Best Floor Mop you can find? Check out our honest ratings first. With so many products on the market, how do you know if you’re buying the best mop for your floors? Have you spent hours dragging around a bucket filled with murky water and strong-smelling cleaners? Do your hands get chapped from wringing a dirty mop head out and rinsing it in the kitchen sink? Mopping can certainly be a dirty, time-consuming chore, so you’ll want the best, most efficient tool for the job. Whether you have vinyl, tile, laminate or hardwood floors, there are great options for any cleaning situation. You’ll want to pick the best mop for both your floor type and the typical level of grime on those surfaces. If you have a busy family with kids and pets, you’ll want both a mop for quick cleanups and one for heavy duty mopping. There are two main types of mops for these jobs – wet mops and dry mops. Many of these employ washable microfiber mop heads and pads so there’s no wringing/rinsing required and no waste from throwaway pads. Dry mops like a dust mop will pick up loose pet hair and other debris. Wet mops like sponge and twist mops are best for ground in grime and sticky messes. They usually have some sort of mop wringer so you can control the amount of moisture needed. For hardwood floors, this is important since too much water could damage them. All of these options are usually very affordable. Mops also go beyond the simple wet and dry options for people who don’t mind spending a bit more. These include steam mops, spray mops, and even robot mops. Steam mops rely on the power of hot steam and replaceable pads and often don’t require any cleaning agents. These can be great if you have allergies or are concerned about exposing kids and pets to chemicals. Spray mops use built-in cleaning fluid containers and easy-to-squeeze triggers to precisely direct the right amount of fluid where you need it most. They’re really good for quick cleanups like sticky spills and pet accidents. Robot mops, as the name implies, are autonomous mopping machines much like robot vacuums that do the mopping for you. They’re the most expensive option on the market, but the time-saving aspect can be a huge advantage for busy working parents. Our mop reviews cover all these options. We compare customer experiences, prices, features, pros and cons and list them all in one place so you can decide which mop will fit your budget and lifestyle. Many people choose steam mops because they clean without chemicals. They have several other benefits as well. 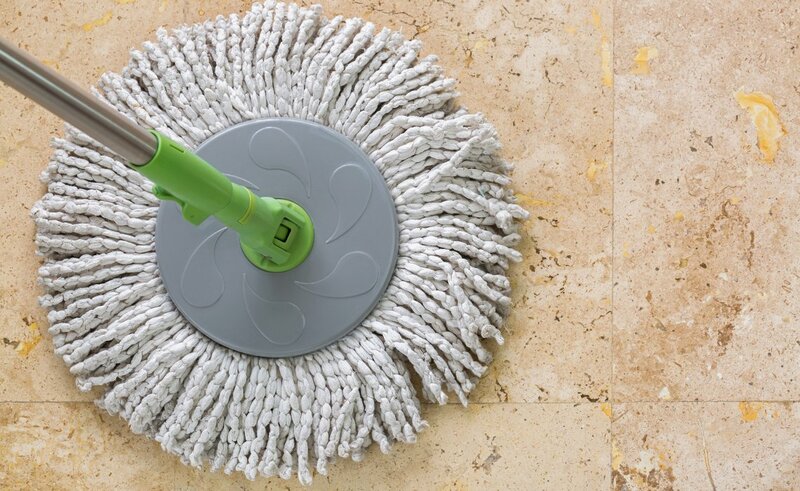 Steam mops can save time and money since you don’t need to purchase additional floor cleaners. The built in water reservoir means no more sloshing mop buckets around. Most of them use washable microfiber pads which, along with the steam, both cleans and sanitizes floors quickly. Plus, floors dry much more quickly than with regular mops. Steam mops work best on completely sealed floors. Using one with a wood floor could be a big no-no, since the pressurized steam can ruin the finish. 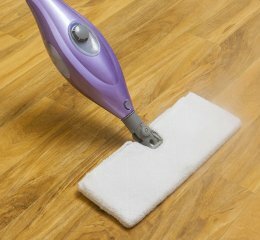 Be sure to check your floor cleaning guide and warranty or consult your flooring manufacturer to see if your wood floor can hold up to a steam cleaning. For other hard floors like tile and vinyl, steam mops can melt away dirt and scuffs, while the microfiber pads soak them right up. After you’ve cleaned a floor with a steam mop, you’ll see the proof that it works in the now very dirty pad. But you can simply toss it in the washer and it’ll be ready to go for next time. Research – Since you’re here, you’re already begun this step. Browse the several brands and take note of the costs, so you can automatically eliminate those that don’t fit your budget. 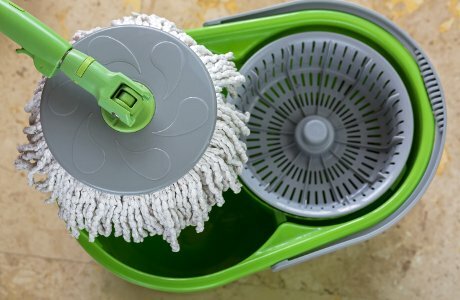 Features – Some steam mops can also double as a vacuum. Some come with extra long cords (great for big rooms). Others have attachments or specialized pads for harder-to-clean areas. 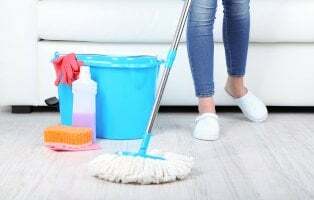 Flexibility – If you need to get under tables or other furniture with low clearance, look for a steam mop that can fold flat as you mop or that have a telescoping handle. Steam control – Look for models with adjustable steam controls. Depending on your type of floor and the level of grime, being able to adjust the steam output can make a big difference in performance while keeping your flooring safe from damage. Stands on its own – Mops that can stand up on their own while heating and cooling are safer since you don’t have to worry about them tipping over. Those that come with a standing pad or tray are great too since they can protect flooring from any water that drips out when not in use. Oh, and one insider tip: Use distilled water instead of tap water to avoid mineral buildup. Does your floor have a lot of surface area to clean? The Shark Genius Steam Pocket Mop blasts through tough dirt with 3 different steam settings. It’s touch-free, meaning you won’t have to touch a dirty pad with the pad release button. Though it is fairly expensive, reviewers loved the adjustable steam settings. They also remarked on how it didn’t leave streaks like regular mops do. If you’re new to steam mops, the O-Cedar Microfiber steam mop is a good, budget-friendly option. It’s as light as the Shark Lift-Away at just 5 pounds. Though it doesn’t have a lot of bells & whistles, it has the unique option of a snap-on glider to refresh carpets. Reviewers loved that it was super quiet and made cleaning corners easy. 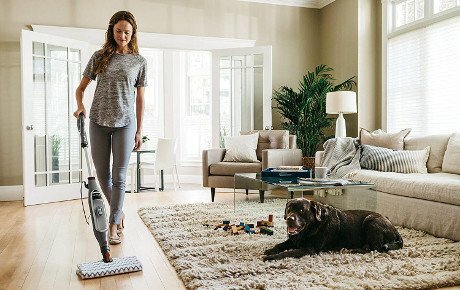 The moderately priced Bissell PowerFresh Steam Mop is a popular model with many nice features, including a flip-down Easy Scrubber and scrubby microfiber pads to tackle those stuck-on spots. Reviewers love the 3-setting digital steam control and Febreeze fragrance discs for a great smell without the need for chemicals.They appreciated the super hot steam, but warned against getting your bare feet too close. Spin mops combine the traditional mop with a hands-free wringing action. Some are even motorized so the mop heads themselves spin to clean the floor. They are an affordable option for those who want the traditional mop experience without all the bending to rinse and wring. Like other wet mops, they are best used on sealed floors, not traditional wood floors. Obviously, the motorized versions will cost more than the manuals, but overall, spin mops are usually cheaper than steam mops and way cheaper than robotic mops. They’re a good step up from the traditional mop and bucket in keeping your hands dry. But then again, there’s still a bucket with the manual models. These can vary widely in size, so make sure you have the space to store it or it will be more hindrance than help. Size – The bigger the square footage of floor to clean, the bigger the mop head should be. Design – You want a sturdy, long-lasting spin mop with features that are practical, not just pretty. Materials – The sturdier the material, the better the mop. Think aluminum or stainless steel over an all-plastic model. Bucket – Is there a good pour spout for emptying? Does it have wheels so you don’t have to carry it as you go? Most are plastic, but make sure it’s thick and sturdy. Handle – If you’re tall, you’ll want a handle that’s long enough to prevent having to bend as you mop. Some handles are telescopic, while others may have separate extensions. 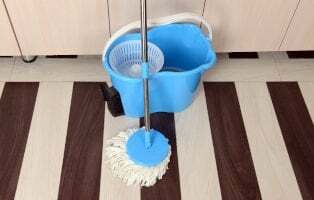 Price – Once you get to the high end of the spin mop price range, you might also consider other mop options like steam and robotic mops, that could offer more ease of use for the price. The Bissell Spinwave is a premium spin mop at a premium price, but is probably the safest spin mop for sealed wood floors. It is motorized with two power spin pads, including two soft touch pads for gentle cleaning. Customers like how well it swivels and the compact size for storage. They also like how easily it glides across floors. The O-Cedar EasyWring Spin Mop & Bucket System is a very affordable spin mop with super-absorbent microfiber strands and a bucket with a built-in wringer. You can control how wet the mop is with the foot-pedal control that activates the wringer. A splash guard on the bucket helps prevent water spray and splashes. Customers liked the mop’s sturdy metal handle and that the mopping action left little to no streaks. The moderately priced Mopnado flattens easily to clean under low clearance furniture and has a telescoping handle up to 56 inches long to clean ceiling fans, etc. The bucket has two wheels and a handle so you can pull it with you like a cooler. A handle-driven spin function allows for both hands-free wringing and rinsing in the bucket. If you’re looking to automate cleaning, look no further than a mopping robot. This new generation of mops is not totally hands free but pretty close to it. All you have to do is fill the tank, press start, and go do whatever. Some even have mobile and voice activation. For those of you who despise mopping, even with a good steam or spin mop, consider a robot mop. You should still keep a regular mop around for sticky messes and hard-to-clean grime. But for a busy working parent, the robot vacuum can be a handy daily helper to keep your floors looking good between deep cleanings. 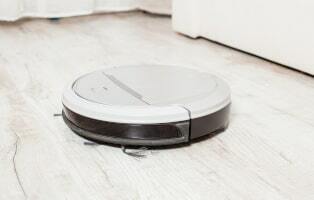 A few single-purpose robot mops are on the market, but most are hybrids that can both sweep (like a broom on hard floors) and mop. Multipurpose machines are a good idea in theory, but may not perform tasks as well as the single-purpose can perform its one job. While robot vacuums have been around for quite some time now, robot mops are still pretty new to the automaton cleaning family. This does mean that they’ve still got some growing pains, as you’ll be hard pressed to find one that works as well as the best robot vacuum. Even the mop/vacuum hybrids aren’t going to work well (or at all) on carpet, so keep that in mind. Some multipurpose models actually have no water tank, so they can work as a dry dust mop, or you can attach a wet cleaning pad. This may require rewetting the pad often if you have a large area to mop. The ones with water tanks can work two ways – with a cleaning pad that stays wet or by spraying water on the floor in front of it. Supervision – Some models can function quite well on their own, while others are going to need a babysitter. The more expensive ones will likely be the best choice if you want it to mop while you’re at work. Water tank – If you only need to mop a small room, the size of the water tank probably won’t matter that much. For large areas, it may need refilling during a cleaning cycle. Changing tanks – For a hybrid sweeper/mop, these machines can’t usually do those simultaneously, so you’ll have to switch from dust canister to water tank when you’re ready to mop. Battery life – For large areas, you’ll want a robot mop with a longer battery life. Preferably, get one that’s intelligent enough to return to a charging dock before the battery dies. Time of day – If you’ll be using a robot mop while at work, consider a model with wireless tech so you can monitor it from your smartphone. If you’ll be using it at night while you sleep, look for one that’s super quiet and doesn’t beep loudly if it gets stuck. 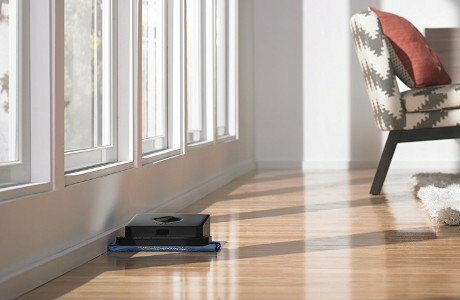 A slim profile robotic cleaner with 140 minutes of battery life that vacuums, sweeps and damp mops. Its 4 cleaning modes provide customized cleanup. A quick-charging robot mop with Northstar GPS for dry sweeping or damp mopping. Cleans up to 1000 square feet in one cycle. A smart robot mop with a 5-stage cleaning system and anti-collision sensors.. Uses Alexa voice and smart phone app controls. An affordable robot mop small enough for hard-to-reach places. Precision jet spray and vibrating cleaning head help with tough stains. Not all flooring is created equally. Vinyl is by far the cheapest and easiest to clean. But hardwood, laminate, and tile, need some special TLC. Chances are you (or a previous homeowner or landlord) invested a lot of money in these types of floors. So keeping them both clean and undamaged is very important. Hardwood floors can be solid or engineered hardwood, which is pressed wood with a layer of hardwood over it. Solid wood, though gorgeous, is more expensive. One challenge with keeping it clean are the grooves between each plank. Crumbs and dust easily accumulate and must be swept or vacuumed frequently. Engineered hardwood flooring often fits together with hardly any space between planks so it’s easier to keep clean and less susceptible to moisture damage. Wood flooring is prone to scratches. When vacuuming or sweeping, you’ll want to turn off the spinning roller, or you can adjust the vacuum to its full height so the roller bristles don’t come in contact with the floor. Brooms should have very soft bristles or, better yet, opt for a microfiber dust mop to remove all the dust and debris. Moisture is another challenge for solid hardwood flooring. If it gets too wet, water can seep in and cause the planks to swell and bow. You should never install hardwood floors in rooms with high humidity such as a bathroom. When mopping, be sure your mop isn’t sopping wet. A damp mop with a microfiber mop head is your safest bet, as it will allow for faster trying to minimize moisture damage. Steam mops should be avoided on many wood floors. Check with your flooring manufacturer before using one. Laminate flooring, commonly called Pergo, has a shorter lifespan than hardwood. It’s made entirely of wood composite (materials like sawdust pressed together) and has a protective clear layer on top. It’s popular because it’s a lot cheaper than hardwood flooring and can be made to look like virtually any wood. It stands up better to moisture than hardwood, but you still want to employ the same cleaning methods to minimize moisture damage. Tile flooring can be more or less expensive than wood or laminate, depending on materials. However, it is the most waterproof and and scratch resistant of all flooring types. It can handle just about every vacuum, broom and mop you can throw at it. Keeping the grout between tiles clean is the biggest challenge. You’ll want to opt for steam mops or spray mops with thick pads or scrubber tools that will reach into the grout. Do You Really Know How to Mop a Floor? You may have been mopping since you were old enough to hold a mop, but that doesn’t mean you’re doing it right. There’s really no rocket science to it, but tweaking a few of your techniques could help get your floor cleaner without damaging it. For starters, you may be mopping too often. Unless you have a high traffic floor that gets dirty quickly, you’ll probably only need to mop twice a month. Otherwise, you may leave sticky cleaner residue all over the floor. This dulls the shine and feels terrible on bare feet. 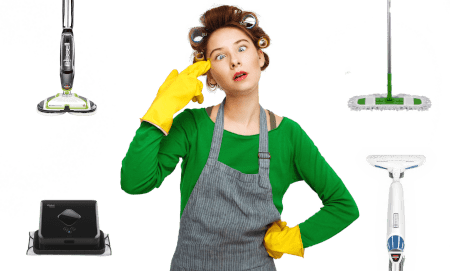 When it’s time to mop (with any sort of mop), brush off crumbs, dust and hair from all portable furniture like dining chairs, bar stools, and small tables. Don’t forget to brush off the chair glides, caster wheels, etc. They catch a lot of hair and dust. Then move the furniture out of the room. Your next step is very important, so listen close. Always. Vacuum. First. Yes, vacuum (or sweep) before you mop! Every time. A lot of people skip this part. Their floors suffer for it. When you mop an unswept floor, you might as well be using sandpaper on it. Mopping over loose debris will leave scratches, especially on wood and laminate. Got that? Good. Once you’ve swept the floor, be sure you’re using the right mop for the job and know the cleaning recommendations for your floor type. For instance, wood and laminate do not fare well with wet mops. Only dry or damp mops should be used on most of these floors. For steam mops, put on the cleaning pad BEFORE you turn it on, or you could burn your hands. Also, don’t leave a steam mop sitting while it’s on. It could burn your floor. Now, here is a surprising technique for mopping vinyl, tile, or other completely sealed flooring. Fill your mop bucket or sink. Add floor cleaner (make sure it’s safe for your flooring type) and DON’T add too much. Less is more. You can also use vinegar or a little dish soap. Dip the mop into the bucket. Give it a few seconds to soak up water. Lift from the water and let it drip into the bucket for 2-3 seconds. Then, slop that very mop on the floor. Yep, don’t wring it first. Move the mop with 3-4 back and forth strokes. Return the mop to the bucket and let the cleaner do its job on the floor for a few seconds. Rinse the mop, THEN wring it out really well. Repeat the back and forth motion, which will soak up all that dirty water. Repeat all these steps, working in small sections until the floor is clean!